Wow I am really behind on getting out my posts for Ozzie's blog. He told me that if had thumbs he would type it himself! Sorry Oz man! Anyway I have provided a link to the article, I think all pet parents should read it! Here is wishing you a relaxing weekend! Let's hope it warms up around here soon! There are just some things that bulldogs do well. One is producing tremendous poops and the other is just laying back and "chillin" like no one's business! Ozzie has his PhD in both subjects! Sorry all those who follow with any kind of regularity. I usually post on Fridays. "Finally Fridays" but had to go into work early yesterday. Believe me I rather be home at the computer with Ozzie at my side than work any day but one needs to make some hay while the sun shines or doesn't in this case! We are bracing for some weekend heavy rains which are really needed here in the NY/NJ metro area, where it has been exceptionally dry! You all have a chance to vote for Ozzie in a contest held by artist Susan Tantlinger. 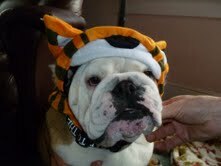 She will paint a picture for free of the bulldog who's photo has the most "Like"'s on her Facebook page. 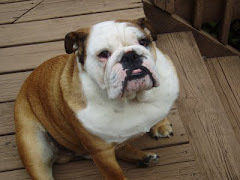 There are so many pics of some really good looking bullies so its going to be a tight race! Below is the link where you can look for the Oz. It's the same picture I have up for today's post. This weekend I am going to make Ozzie some turkey meatballs. I am going to give them an extra nutritional edge by sauteing some spinach in EVOO and adding it to the ground turkey with some egg. Simply form the mixture into golf size meatballs and bake them in the oven at 350 for 20 minutes until done. Served cooled with some kibble and life is good! Over the weekend we went out and purchased a new vacuum. I had researched all the different brands touted as "animal vacuums" and this one came up as the most effective upright to battle pet hair. It is the Miele Cat and Dog. With a powerful 12 amp motor and sturdy sleek design it should be a challenging foe to wandering dog hairs! The Dyson 41 Animal came in a close second for me. It got good customer reviews and was at the same price point as the Miele. But when I saw it in the store it has an awkward profile which would make it hard to get under furniture and it was all plastic in comparison to the Miele which is of a sturdy design (German made superior quality!) and the Meile has a 7 year warranty compared to the Dyson 5 year. The only drawbacks I am seeing for the Miele is that it's heavy. So for those who lack any upper body strength you may want to pass on it. Also the Cat & Dog uses bags opposed to the Dyson which has a dirt canister that you empty. Though the bags leave less mess when emptying out they are a bit pricey to purchase at four bags for 18.00. I have been told that the bag takes a while to full so maybe it won't be that costly in the long run! Ozzie doesn't seem to mind the new addition to my cleaning arsenal. It has a quiet motor and does not disturb Ozzie's power naps one bit! Hopefully the fur will not be flying high as it once was and I won't be finding dog hair in my shoes anymore! So we have all made it to a conclusion of another week! The weekend holds promise of bright sunshine and warm temps! I suspect there will be a lot of sunbathing on the deck going on. At least for Ozzie! Friday the 13th makes the rounds 3 times this calendar year. There was one in January and another will rear its superstitious head in July. I myself try to look upon it as somewhat of a lucky omen. Though there was a ladder outside the door at work today that I precariously avoided and I suspect someone will eventually call me out on the four leaf clover I hold dear in my wallet! Ozzie on the other hand thinks nothing of superstitions and just looks at the day as another Friday which he will get some left over pizza crust as usual! Here is wishing you all out there the best of luck on this Friday 13th! 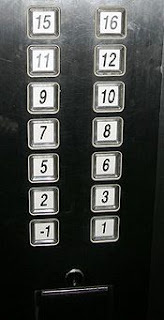 Looks like the 4th,13th and 14th floors are missing here in this Shanghai elevator. It even has a negative One floor! They must have some issues there with those numbers?! Plush toys with squeakers are exciting fun for most dogs. The squeaker noise mimics the sound of prey that is going down for the count that dogs instinctively relate to. There are a couple problems with these type of toys. Number one is that the squeaker can be ripped out by a more aggressive pup and present a choking hazard! Number two, when the squeaker itself gets punctured it no longer works and the toy is not that interesting any more. I found a toy online that seems to be built tough with squeakers that even when punctured by your dogs choppers still keep on squeaking away! It's called Kyjen Invincibles Snake. I think its worth a try since most of Ozzie's toys end up in his toy bucket never to see the light of day again. What's another 17.00 dollars?! Below is a link to a demonstration of the squeaker snake toy that seems impressive in terms of durability. "Almost have this one done in!" We had a very nice Easter yesterday. Rosie the mini Australian Shepard came to visit with my brother and his girlfriend. I think Rosie is getting use to Ozzie's in your face approach to being canine chums. Though Ozzie could use a dose of Emily Post on how to treat guests in one's home. Earlier in the day Ozzie decided to take a snooze outside. It was funny because at first I couldn't see him in the yard. Then I spotted him up against the fence in the dirt. I guess if I was a dog I might find it a pleasant place to take a nap! Finally Friday and Happy Easter/Passover! Here is a smiling Ozzie out on the deck after soaking in some sunshine! 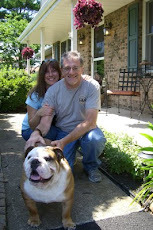 l aways thought that when I would see a picture of a "smiling" bulldog that it was a happy bulldog. Now I know that it's actually because he is over heated and is trying to cool himself down by panting. Not as cute as you thought, huh? Ozzie had spent way to much time in the sun and even though it was only 57 degrees he still got over heated. I don't know how bulldogs in Florida survive the heat down there?! They must spend all their days inside with the AC turned up high! Hope you all have a wonderful Passover and a joyous Easter holiday this weekend! 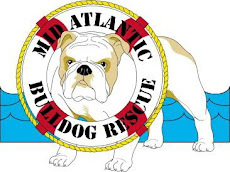 I added a link below to give you some information on what happens when bulldogs and other flat nosed (brachycephalic) breeds over heat. Those who are not familiar with these breeds may not be aware how quickly this can occur and how dangerous it is for them! Wordless Wednesday and Don't Pee on my Ivy! "I love to pee on the neighbors ivy!" Ivy must be pretty hardy because Ozzie can't help but leave his mark on it every time! Hope the neighbor doesn't wise up to us! Yes its Spring and with that brings tufts of fur blowing through the house that invade every crevice! Nothing is safe from the fleeing fur! Ozzie's Pop gave him a good brushing yesterday that disbursed the hair throughout the neighborhood. This has got me thinking about purchasing a new vacuum to combat the stuff. The old Hoover is hopelessly clogged with fur and dander and is not as effective as it once was. I am considering the Miele Dog and Cat. It seems to have the best ratings and consumer reviews. The price tag is pretty hefty though at 649.00, so this may not happen right away! Until then let the fur fly I suppose!